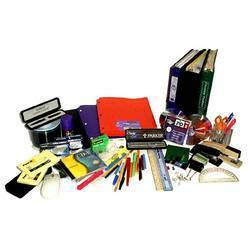 Our domain expertise is in offering the supreme quality Stationery Products. The product is appreciated in the market due to its superior finish & excellent quality. Our provided product is manufactured with high grade material and latest tools under the direction of experts. The product offered by us is obtainable from us in several sizes & other related options so as to fulfill our patron’s demand. Our product range includes pen stand, paper weight, markers and writing pads. The products offered by us are useful for organizing desk top space and increasing its aesthetic appeal. Looking for Stationery Products ?